The pantry, closet, and cabinets are notorious for being the center of clutter in your home. Fortunately, there are numerous ways of creating order out of the chaos using inexpensive or even zero cost simple DIY ideas and hacks. Here are a few practical and cheap DIY hacks to keep things well organized in your pantry, closet or cabinets. 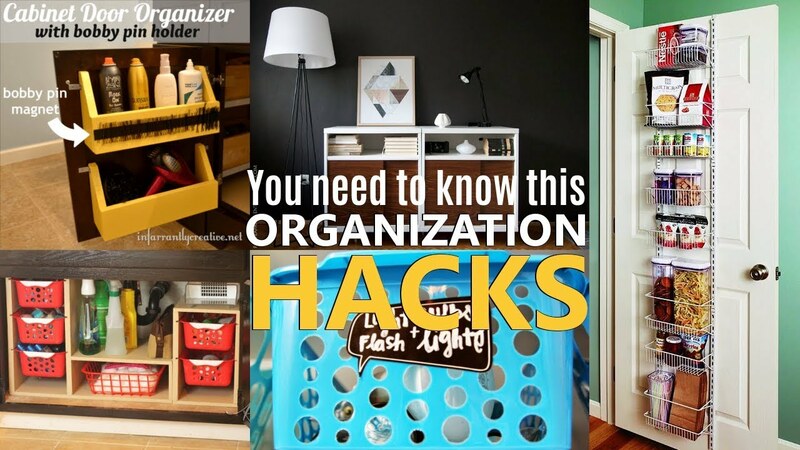 This is 27 Organization Hacks You Need To Know or try at least one in your lifetime. 1. Organize This: Storage Solutions for a Skinny Pantry. A disorganized pantry is everyone’s worst kitchen nightmare. It’s worse when you have a skinny pantry stuffed with all forms of food clutter. Getting a small packed pantry organized may seem like a herculean task but by rearranging the shelves and doing a few alterations suggested in this simple hack, you’ll have more space for your canisters and still leave plenty more room for other stuff. 2. Organized Kitchen Pantry [Closet] Reveal by Four Generations One Roof. Hold a second, Before we jump to number 3, I suggest you to check this video if you prefer to enjoy this list in a different format. The video features richer presentation format with a nice voice over that I assume you are going to miss. 3. How to Double Your Pantry. Who wouldn’t love to organize their pantry and make it twice as big? Well, everyone would. Here are 11 ways to get your pantry in perfect order and create even more space. These are useful practical ideas from attaching sink caddies to the unused wall space, using shoe organizers as snack storage, keeping snacks in a fishbowl for easy reach, keeping your pantry well organized with file folders, installing a door rack on your pantry door for more storage space, and much more. 4. How to Transform a Coat Closet into a Pantry. Whether large or small, the kitchen pantry is one of the most useful features of a kitchen. Everyone needs a nice well-organized space to store food items. Unfortunately, not everyone is blessed with a walk-in pantry. Most of us have to contend with tiny pantries but with a little ingenuity you can easily convert your coat closet into a nice double door pantry. 5. How to Store More in Your Pantry. Ever noticed how packed your pantry becomes during fall and winter? This is a perfect time to look for better and less expensive storage solutions to create as much space in your pantry as possible. This simple storage hack includes lots of practical storage ideas from the web including using crates on wheels, building under-shelf racks, and different types of shelving such as pencil holder, magazine rack, and clear-sponge holder shelving. The goal is to create as much storage space in your small pantry as possible. One of the biggest headaches when you have zero pantry space is finding space for everything you need to store. The simple solution, as well demonstrated in this hack, is to recreate an Elfa pantry complete with all its gray shelves and cake pedestals. This is a practical easy-to-do hack that leaves you with even more storage space in your pantry. 7. Laundry Room to Pantry Makeover by Kevinandamanda. It is quite possible to rip out your laundry room and transform it into a nice, more spacious pantry. But where does the laundry room need to go to? The garage, of course. You can then repurpose the sink, cabinets, and all that space left behind into a large useful pantry to store your food. 8. Get This Cheap, Simple Yet Clever Tiered Cabinet Organizer. 9. Pantry Hack Ideas by Todayscreativelife. Keeping your pantry well organized may be a simple task for those with large walk-in pantries but for the rest of humanity with skinny pantries, food storage organization is never on top of their list of priorities. Small packed pantries are never a pretty sight to behold, with food items piled on top of each other. Here is a hack to solve the cluttered pantry nightmare using a few locally available items. 10. Bathroom Closet Organization Initiative by ABowlfulloflemons. It’s just natural for bathroom items and accessories to pile up within a short time leaving you with unnecessary clutter and waste of precious space. Here are a few handy tips and tricks to regain control of your bathroom and keep everything in a well-organized and stylish way. The key focus here is on transforming the closet door into a functional storage feature. Plastic shoe boxes are also very useful storage items. 11. 5 Steps to the Perfect Linen Closet. When it’s time to de-clutter your home and keep everything in perfect order, your linen closet is worth some attention too. If you live in a small house where the linen closet also doubles up as the cleaning closet, here are some tips to get the most out of the available space and keep your home tidier. 12. Dollar Tree Closet Makeover by Homemadeginger. If truth be told, most of our homes have closets and drawers that seem to have jumped out of a horror movie. Our closets and drawer are usually the unfortunate victims of clutter where everything is hurriedly dumped, hoping that someday we’ll get time to sort things out. The hallway closet is by far the hardest hit victim of clutter. You can give it an inexpensive makeover with a few Dollar Tree items and create more storage room and breathing space. 13. Cleaning Closet Hack by The36thavenue. Cleaning and organization tips are always a welcome, especially for the utility or cleaning closet. If you are tight on space, the entryway closet can be a perfect cleaning zone to store all your cleaning supplies. You can transform the closet into a more useful storage space with a few simple inexpensive items suggested in this hack. 14. DIY Door Spice Rack Hack. It is important to ensure that you use every available space in your pantry, including the door. Things like spices that tend to eat up much space in your drawer can be stored more conveniently in a modified spice rack on the top half of the door, out of children’s reach. 15. How to Add DIY Shelves in a Closet. It is always a good idea to add extra shelves in your closet to create more storage space and better organization. You can easily do this in a simple DIY project using melamine shelves, 2×3-inch wood, and a few inexpensive items. This is an easy project that anyone can manage. 16. DIY – Small Closet Hack by “Remodel and olacasa”. This is a small closet but see how beautiful and functional it turned out after a little modification here and there. It even looks bigger. The bins in the shelf wall fit in really nicely and those rusty gold knobs cost just five bucks. This is a simple but awesome makeover that you can also give your small closet to create more room and keep things well organized. 17. 4 Easy Ways to Design Your Reach-in Closet. 18. Take the Doors Off. Looking for more closet space? Remove the closet doors and you’ll have a few extra inches to reach in and retrieve anything from the closet with much ease. You could also use the more affordable IKEA Algot system to keep your clothes and other accessories neat and better organized. 19.Small Closet Hack with DIY Garment Rack Makeover. This is a perfect DIY makeover project for anyone with a tiny closet but needs more space. It is a simple hack that not only creates space but decorates your closet too. It gives you more space and a beautiful addition to the room. 20. Next to Fridge Hack. Here is how to create a functional and aesthetically pleasing extra storage next to your fridge. It is a practical feature that’s also easy to build. It fits well with your interiors and gives you so much extra room. 21. DIY Canned Food Organizer Hack. This beautiful canned food organizer is perfect for a small kitchen but does a great job of providing more organized storage space. It is a handy feature to have if you don’t have a pantry or if the pantry is too small. 22. Cabinet Hack Using Rubbermaid Spice Rack . 23. Create a Veggie Pantry in Pull Out Bins Inside a Cabinet. The veggie pantry can easily be built inside a cabinet using inexpensive pull out plastic bins. This is a simple DIY project worth trying to keep your vegetables fresh and neatly stored. It helps to keep everything well organized inside the pantry. 24. Under sink Cabinet Organizer with Pull Out Baskets. The least organized places in most homes are those cabinets stuck under the bathroom sink. Most people find it hard to deal with the cabinets especially with drain pipes hanging down and eating up good usable space. The cabinets are usually a dumping ground that’s often neglected but they can be transformed into handy storage space using pull out baskets. 25. IKEA Besta Mid-Century Modern Cabinet Hack. This is an exciting project where you can modify furniture to create a mid-century modern style in your apartment. It doesn’t cost much. You just need a few affordable items from IKEA and a little creativity to achieve this mid-century modern look in your living room. 26. Cabinet Door Storage Hack. Here is another functional way of putting your cabinet door into good use. You just need some pine wood and a few tools to transform your plain cabinet door into a storage unit that can hold your hair dryer, bobby pins, and other items. The school year is on and you need a better way to organize the endless stream of chips bags and other snacks. Here is a simple hack to create a fun and functional storage space to stack lunch-sized bags of chips. It is a creative way of displaying the chips while saving pantry space.